Out of print for more than five years, Drum Corps World publisher Steve Vickers will be re-printing a limited number of copies of his book, "A History of Drum & Bugle Corps, Volume 1." "Because of the increasing possibilities offered by digital printing-on-demand, we are planning to reprint a limited number of copies in soft cover," said Vickers. "Over the last five years, a good number of people have inquired about the book's availability, even about copies offered on eBay. To my knowledge, no one who purchased the original book has advertised their copy for sale," he says of the book's popularity among drum corps fans. 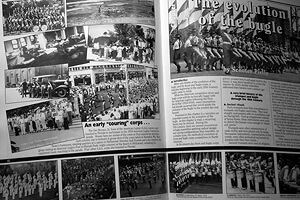 The 432-page anthology traces the roots of the drum corps activity from the emergence of veterans' organizations after World War I, to the founding of Drum Corps International in the 1970s and beyond. Among the publication's 17 chapters are more than 1,400 photos, a list of scores from major competitions from 1921 to 2001, and an inclusive roster of more than 7,000 drum corps. Those interested in obtaining a copy should contact Vickers by phone at 800.554.9630 or by e-mail at publisher@drumcorpsworld.com.